Alain Boublil and Claude-Michel Schonberg are reworking their musical Martin Guerre in the hope that it can return to the West End next Autumn. 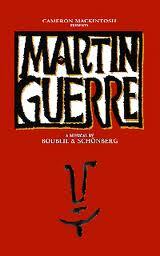 I saw Martin Guerre when it first opened in London in 1996 where it ran for two years and have to say I really enjoyed it. The writers say it is currently undergoing a very “deep rewrite” and it will be a completely new version. They also said are revisiting the musical because they “still think it’s not finished" and have just started to “undo act two”.